Thank you for joining me on this quest for relevance. This book was a pleasure to write, a learning journey that challenged and inspired me. I experienced a lot of positive cognitive effect as I wrote it (accompanied by plenty of effort). I am especially grateful to Elise Granata, who served as lead content reviewer, editor, and cheerleader-in-chief. Elise also designed the beautiful cover and interior of this book. I thank Jon Moscone for writing the preface—actually, several prefaces by the time we finished—and lending his considerable experience and reputation to help make this book relevant to people beyond my world. I greatly appreciate the James Irvine Foundation, which provided a grant to help support this book’s development. The arts program officers at the Irvine Foundation—Josephine Ramirez, Ted Russell, and Jeanne Sakamoto—are fiercely dedicated to making the arts matter to more people. They are fighting battles for relevance in the field of philanthropy, and they inspire me. The great pleasure of this work was the opportunity to learn as I wrote. I didn’t start with a thesis but rather with a set of questions I eagerly explored with the help of expert guides. Bill Ladusaw gave me a crash course in linguistics and the academic study of relevance. Monica Montgomery helped me learn more about issues of relevance and cultural appropriation around the #blacklivesmatter movement. Adam Boal, Alexandra Fitzsimmons, Drew Himmelstein, Kemi Ilesanmi, Jon Moscone, and Whitney Smith turned me onto stunning examples I never would have found on my own. And everyone profiled in the book gave generously of their time in interviews, fact-checking, and thoughtful discussion about their work. Thanks too to Museum 2.0 readers for giving me the space to write this book. While I never asked your permission directly, this book was only possible because I broke my nine-year streak of weekly blog posts to make space to write it. Even when I was afraid I might let you down, you believed in me and encouraged me on this path. I am especially grateful to everyone who read the open call for case studies on the Museum 2.0 blog and took the time to share a story with me. 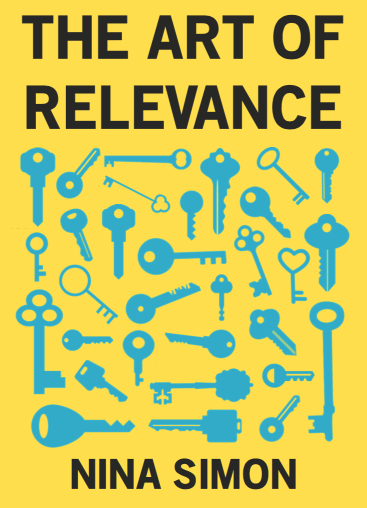 There were several people who submitted stories of relevance that could not make it into the book for any number of reasons. I hope you will keep sharing your stories at www.artofrelevance.org. It’s a good thing that we work in a world where there are too many relevant examples to fit them all in one book. The content reviewers for this book were both brutally honest and terrifically supportive. Thank you to Jasmin Avila, Hannah Fox, Elise Granata, Porchia Moore, Ian David Moss, Devon Smith, Mimosa Shah, Beck Tench, Kevin Von Appen, Bruce Wyman, and Laura Zabel for making this book better. I couldn’t have written this book without my family. My mom Sarina and husband Sibley both did close reads on the final draft, deftly making it better. Sibley graciously gave me the space to write, whisking our toddler out of the house when necessary. My sister Morgan was writing a book at the same time, and we encouraged each other on our parallel journeys. My dad, Scott, allowed himself to be turned into a case study. They are all amazing and I’m lucky to have them. Finally, I want to thank the incredible staff and board members with whom I work at the Santa Cruz Museum of Art & History. I have learned so much about relevance from and alongside you. Every day, I am amazed anew at how you strive for relevance, confront its challenges, and wrestle with its paradoxes. You inspire me to keep working and dreaming with our diverse community. Thank you.